April is Autism Awareness month, and the romance reading community is celebrating! 1 in 68 children is diagnosed with Autism every year, making it the fastest growing and one of the most prevalent developmental disabilities. Authors Ginger Scott and Kennedy Ryan have organized a MegaGiveaway called LIFT featuring more than 50 authors to raise awareness and acceptance! Each Monday in April, a new rafflecopter will go live, loaded with e-books, audio books, swag packs, signed paperbacks and gift cards from these amazing authors doing their part to LIFT4Autism. And there’s LIFTWear – 4 styles to choose from! 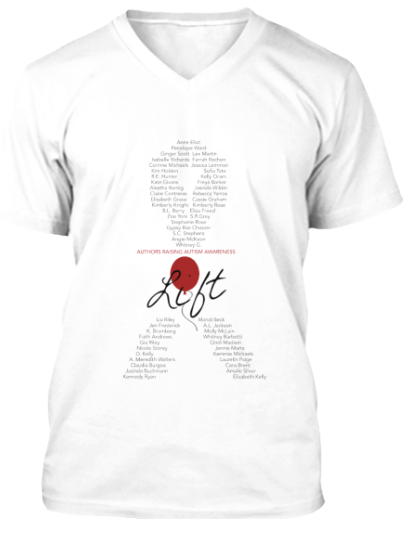 All proceeds from the LIFT t-shirts will go to a national autism organization. Order t-shirts (http://teespring.com/Lift4Autis) until MONDAY, APRIL 13! « Kaleidoscope Hearts Spin Off, anyone?